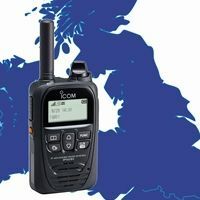 Icom’s new PoC (Push-to-Talk Over Cellular) radio system allows you to communicate with your two-way radio system over a 4G/LTE closed network. PoC radio offers instantaneous communication over a pre-established cellular network so you can enjoy licence free nationwide coverage for your business. It does not require its own repeater or IP network and thereby reduces the cost of building and maintaining a wide area radio network.